The Serpentine Gallery presents an exhibition of the work of the celebrated American artist Jeff Koons. This will be England’s first ever major survey of Koons’s work in a public gallery. For his exhibition at the Serpentine Gallery, Jeff Koons presents works from his Popeye series, which he began in 2002. The works incorporate some of Koons’s signature ideas and motifs, including surreal combinations of everyday objects, cartoon imagery, art-historical references and children’s toys. The sculptures on show continue Koons’s interest in casting inflatable toys. Those typically used by children in a swimming pool are cast in aluminium, their surfaces painted to bear an uncanny resemblance to the original objects. On exhibition 2 July through 13 September, 2009. Koons has used inflatables in his work since the late 1970s. He further develops his use of cast inflatables in the Popeye series by juxtaposing these replica ready-mades with unaltered everyday objects, such as chairs or rubbish bins. The paintings in the series are complex and layered compositions that combine disparate images both found and created by Koons, including images of the sculptures in the series. Featuring loans from both public and private collections, the exhibition also includes works that have never been shown publicly before. The immediately recognisable figures of Popeye and Olive Oyl are central in the series and they appear in several prominent works within the exhibition. One of the most iconic American cartoon characters, Popeye was conceived 80 years ago this year in 1929 when the Great Depression was taking hold. In Popeye’s early years, the cartoon addressed the hardships and injustices of the time and, in this current period of economic recession, he is a fitting character to rediscover and explore. Jeff Koons: Popeye Series is curated by Julia Peyton-Jones, Director, Hans Ulrich Obrist, Co-Director, and Kathryn Rattee, Curator, Serpentine Gallery. Working in thematic series since the early 1980s, Koons has explored notions of consumerism, taste, banality, childhood and sexuality. He is known for his meticulously fabricated works that draw on a variety of objects and images from American and consumer culture. Jeff Koons first exhibited at the Serpentine Gallery in 1991 as part of the group show Objects for the Ideal Home: The Legacy of Pop Art. His work also appeared in the exhibition Give and Take that was organised by the Serpentine Gallery and the Victoria & Albert Museum in 2000, and as part of In the darkest hour there may be light – works from Damien Hirst’s murderme collection at the Serpentine in 2006. Koons took part in a headline event in the Serpentine Gallery’s summer events programme, Park Nights, in 2006. He appeared as part of a panel discussion involving Hans Ulrich Obrist and Rem Koolhaas, the architect of that year’s Serpentine Gallery Pavilion. Koons also contributed to Hans Ulrich Obrist’s recent book Formulas for Now, which was presented at the Serpentine Gallery Experiment Marathon in 2007. Jeff Koons was born in York, Pennsylvania, 1955. His work has been widely exhibited internationally. His most recent solo exhibitions include presentations at the Château de Versailles, France; Neue Nationalgalerie, Berlin; Museum of Contemporary Art, Chicago; and Metropolitan Museum of Art, New York, all in 2008. 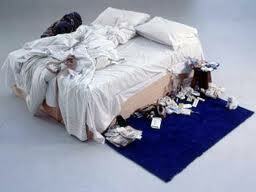 Koons lives and works in New York. A “musketeer” painted by Pablo Picasso was one of the big attractions at an auction of impressionist and modern art at Christie’s held in London, where it sold for 5.7 million pounds ($9.3 million). The 1969 work, “Homme a l’Epee,” was the second most expensive lot of the session, after Monet’s “Au Parc Monceau,” that went for 6.3 million pounds ($10.3 million). Painted on canvas, the Picasso work shows an exhuberant and colorful swordsman in a scene that mixes thick brush strokes in which red and yellow predominate. Just by chance the rival auction house Sotheby’s is offering this Wednesday to the highest bidder another musketeer – this one painted on wood – by Picasso, executed on July 25, 1969, one day before the one sold at Christie’s. Both works figured in the famous 1970 exhibition at the Palace of the Popes in Avignon, France, together with other musketeers, lovers and gentlemen, all charged with energy and a contagious humor. Another important Spanish artist, Joan Miro (1893-1983), led the bidding Tuesday at Christie’s, where his “Peinture (Femme se poudrant)” sold for 3.9 million pounds ($6.4 million). The top price was paid for Au Parc Monceau, 1878, by Claude Monet (1840-1926), an important painting from the vintage years of Impressionism which realised £6,313,250 / $10,284,284 / €7,392,816. It had been sold at auction only once before when it realised £3.7 million in June 2001 in London. 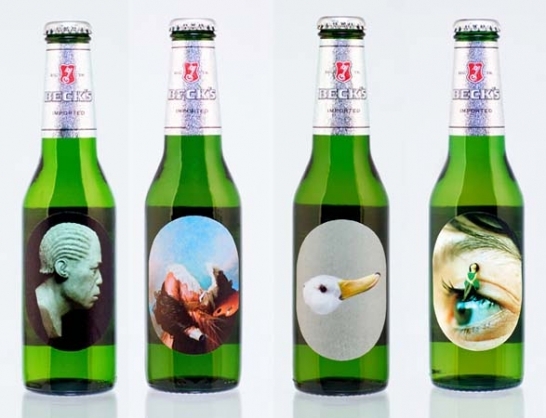 At this evening’s auction, 2 works of art sold for over £5 million / 9 for over £1 million. Buyers (by lot / by origin) were 83% UK and Europe, 14% Americas and 3% Asia. Painting, 1949, by Joan Miró (1893-1983), one of an outstanding group of pictures described as being among the most important of the artist’s career which sold for £3,961,250 / $6,452,876 / €4,638,624 against a pre-sale estimate of £2.2 million to £2.8 million. Two large, bold works from the 1960s by Pablo Picasso (1881-1973); Homme à l’épée, 1969, which was last sold at Christie’s London in February 2005 for £2.7 million, and which realised £5,753,250 / $9,372,044 / €6,737,056 at this evening’s auction (estimate: £5 million to £7 million), and Nu assis et joueur de flûte, 1967, which realised £3,401,250 / $5,540,636 / €3,982,864 (estimate: £3 million to £4 million). Springende Pferde, 1910, by Franz Marc (1880-1916), an exciting breakthrough painting in which the artist embraces the influences of the avant gardes of the period, which was offered at auction for the first time and which sold for £3,737,250 / $6,087,980 / €4,376,320 (estimate: £3 million to £4 million). Elsewhere in the sale, Hélène by Alexej von Jawlensky (1864-1941) sold for £1,721,250 / $2,803,916 / €2,015,584; Mohn by Emil Nolde (1867-1956) realized £1,273,250 / $2,074,124 / €1,490,976, and Composition by Fernand Léger (1881-1955) sold for £1,217,250 / $1,982,900 / €1,425,400. Further highlights included Buste de Diego sur tige, a bronze by Alberto Giacometti (1901-1966) which sold for £1,026,850 / $1,672,739 / €1,202,441 (estimate: £750,000 to £950,000) and Mont-roig, le pont, an important early landscape by Joan Miró (1893-1983) which was painted in 1917 near his family home in Catalonia and which sold for £541,250 / $881,696 / €633,804 (estimate: £400,000 to £600,000). UK artist James Cauty presents his latest exhibition of work titled Splatter at The Aquarium in London. 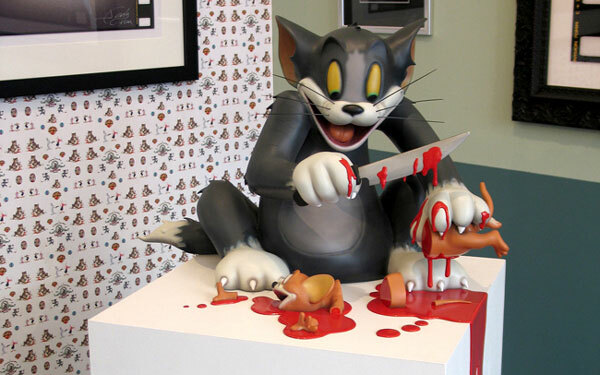 Taking those nostalgic childhood memories of Warner Bros. cartoon characters, Cauty gives us a violent yet accurate representation of what would’ve really happened had Tom & Jerry been on HBO. 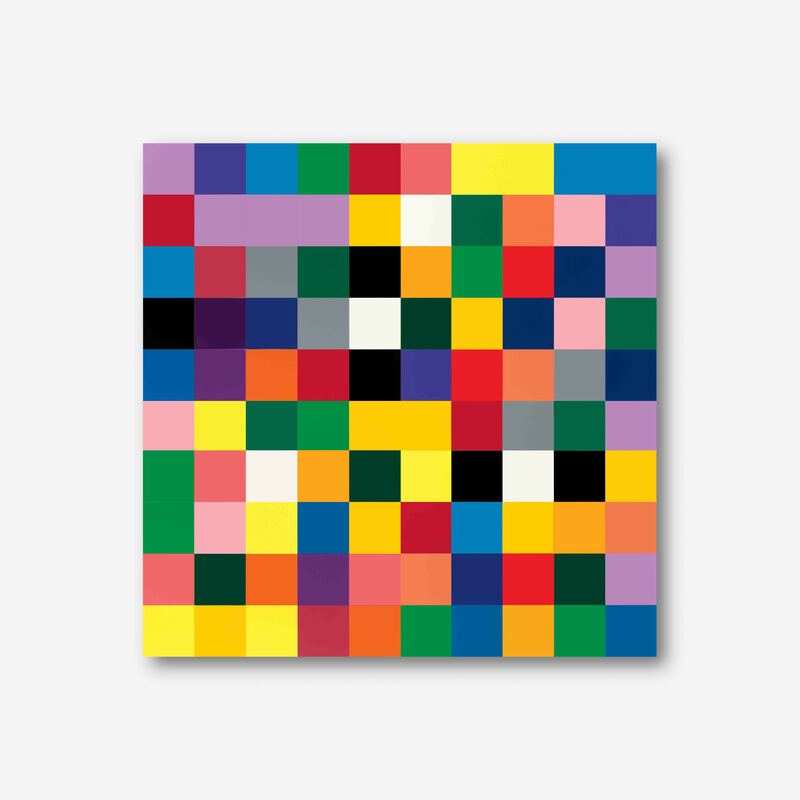 Just opened up at Serpentine Gallery in London, German artist Gerhard Richter showcases his newest piece titled 4900 Colours: Version II. 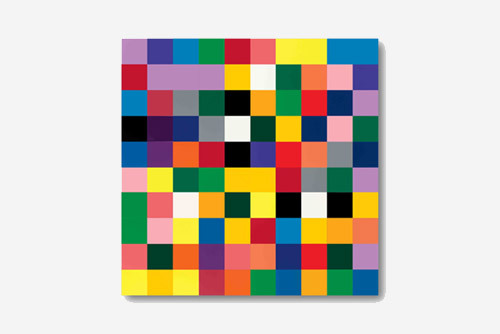 Comprised of 4900 brightly colored squares randomly arranged it features the Richter created concept labeled “controlled chance”. Painted on 100 aluminum panels, the work measures 69 square meters a piece and can be displayed as 49 separate pieces. The exhibition can be seen until November 16, 2008. This competition for young, up and coming architects is one of the star features of the East End show. Check out the winning installation for 2008 by Working Architecture Group. 18-21, Truman Brewery, Brick Lane. Last year it was the women, Amanda Levete and Zaha Hadid, showing off their curves at the South Bank, this year it’s a man’s turn. British Architect David Adjaye has been invited to install a conceptual pavilion for the duration of the festival. (Pictured below right.) 13–30 September, South Bank Centre. This guerilla installation in the Brompton Design District is a collaboration between Flower Council of Holland and the curator Jane Withers. Together they have invited two design partnerships to create a floral feast. Lisa White with Graham Hollick offer “Appetites” and Niels van Eijk and Miriam van der Lubbe present five “Bouquets of Emotions.” 15–19 September, 29 Thurloe Place, South Kensington. Known for producing design-art of the highest caliber, design manufacturer of the moment Established & Sons is opening a new showroom in North London. Their new 6000 square-foot space will show work by great contemporary names such as BarberOsgerby, Paul Cocksedge, Jaime Hayon, Jasper Morrison and Sebastian Wrong 15-23 September, Wenlock Road, N1. The Financial Times hosts breakfast talks at the Southbank Centre with themes such as Creative Cities, Creative Brands and Sustainability. 15 – 19 September, Royal Festival Hall, South Bank. 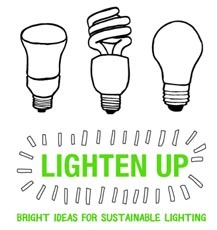 This series of events, talks and workshops, curated by Sophie Thomas of Thomas Matthews, Sarah Johnson of [re]design and Anne Chick from the Sustainable Design Research Centre at Kingston University, promises to be a fascinating insight into the world of sustainable design. 15 – 23 September, Design Council, 34 Bow Street, WC2E. At the V&A this summer, Fashion V Sport, will explore the relationship between contemporary fashion and global sportswear brands. Both industries have been inspired by street style and have been working in closer collaboration in recent years. On display will be around 60 outfits including performance sportswear, work by fashion designers such as Stella McCartney who have designed sportswear ranges, and garments such as the work of Japanese label Visvim which show the influence of sportswear on high fashion. There will also be design drawings, photographs and film to examine how these products are worn, designed, advertised and collected. On view through 4 January, 2009. 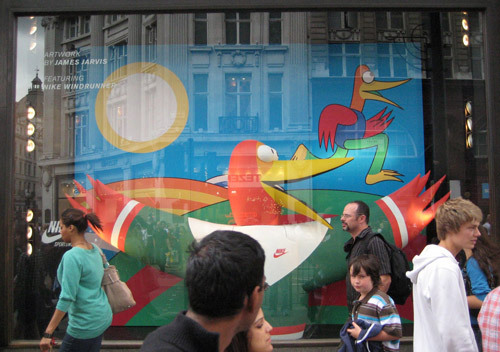 Celebrated artist James Jarvis has a new installation at the Niketown store in London. Showcasing his famous style, the windows are decorated in a wind runner bird print, a character he created within his realm of ideas. There is also an 8-panel vinyl piece inside the store featuring the same clever imagery. Make sure to stop by Niketown if your in London, it looks like an awesome installation and a free James Jarvis poster is always nice. London played host to street artists from all over the world this May for Banksy’s ‘The Cans Festival’. The 40 artists’ work, which spanned the inside of an entire train tunnel, has been released in this compiled in this time-lapse video, showing the space from conception to completion.